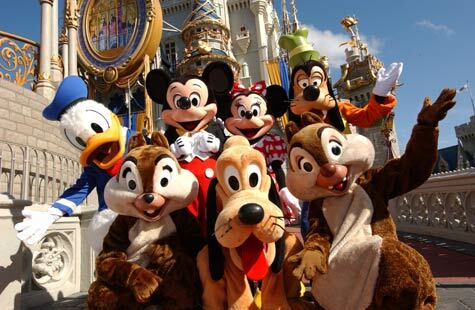 The Walt Disney World Resort, informally known as Walt Disney World or simply Disney World, is an entertainment complex in Bay Lake, Florida (mailing address is Lake Buena Vista, Florida), near Orlando, Florida and is the flagship of Disney's worldwide theme park empire. The resort opened on October 7, 1971 and, according to Forbes, is the most visited vacation resort in the world, with an attendance of 52.5 million annually. It is owned and operated by Walt Disney Parks and Resorts, a division of The Walt Disney Company. The property covers 27,258 acres (11,031 ha; 43 sq mi), in which it houses 27 themed resort hotels, four theme parks, two water parks, four golf courses, one camping resort, one residential area and additional recreational and entertainment venues. Magic Kingdom was the first and original theme park to open in the complex followed by Epcot, Disney's Hollywood Studios, and Disney's Animal Kingdom which opened later throughout the 1980s and 1990s. Designed to supplement Disneyland in Anaheim, California, which had opened in 1955, the complex was developed by Walt Disney in the 1960s, though he died in 1966 before construction on "The Florida Project" began. After extensive lobbying, the Government of Florida created the Reedy Creek Improvement District, a special government district that essentially gave The Walt Disney Company the standard powers and autonomy of an incorporated city. Original plans called for the inclusion of an "Experimental Prototype Community of Tomorrow", a planned city that would serve as a test bed for new innovations for city living.